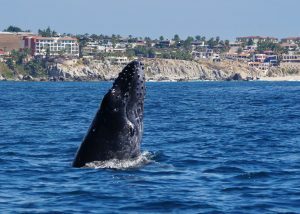 To all appassionate Whale Watchers, we at Cabo Trek decided to start a series dedicated to the different Whales behaviors. 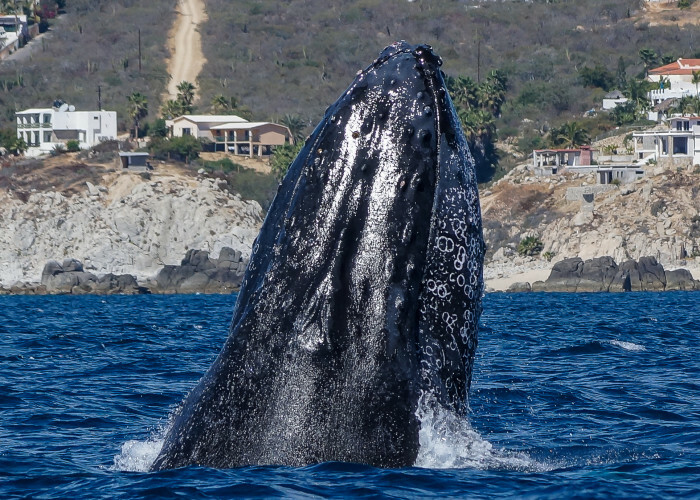 Here in Cabo San Lucas, Mexico we are privileged enough to be able to witness some of the largest animals on earth. As well, during our whale watching tours we usually are able to observe them doing some of the most impressive animal behaviors known to science. One whale behavior which is exhibited in Los Cabos by the humpback and gray whale populations is the “spy hop.” Of course, this is not the only place to see whales performing a spy hop, but it is one of very few places where you can witness mothers and calves spy hopping together. A spy hop occurs when the whale lifts its head out of the water in a vertical orientation until just above his pectoral fin, and then spins slowly in a 180 degree fashion. This is always a fun sight to see, mainly because the lucky onlooker is able to see the whale’s eye, as if he were checking out what’s going on topside. At Cabo Trek we plan a third of the year around watching these amazing giants, but I guess that the whales like watching humans too! Spots on our boats are limited so make sure to reserve yours. Click here to check availability or contact us.